Ballan shire (1864-1994), north-west of Melbourne, was situated west of Bacchus Marsh shire. Its administrative centre was Ballan on the old Western Highway 70 km from Melbourne. The shire, approximately rectangular in shape, had an area of 919 square kilometres. It was proclaimed on 2 November 1864, the successor to a Road District created two years before. The northern part of the shire was mostly the Wombat State Forest, the location of numerous timber towns which supplied the Ballarat district with mining and building timbers. Blakeville, Korweinguboorn and Spargo Creek are enclosed by the State Forest. There were also gold towns, notably Blackwood and Barry's Reef. Southwards the land was elevated compared with the basalt plains closer to Melbourne, and hence cool and moist, but not heavily forested. There was a belt of gold towns, including Gordon, Mount Egerton and Morrisons in the southern part. The shire's western boundary approximated the Ballan-Daylesford Road and the eastern boundary ran from east of Blackwood and south beyond Myrniong. The shire's growth depended on a mixture of gold, timber and grazing. Grazing now predominates, as sawmilling became restricted to areas north of the former shire around Trentham. 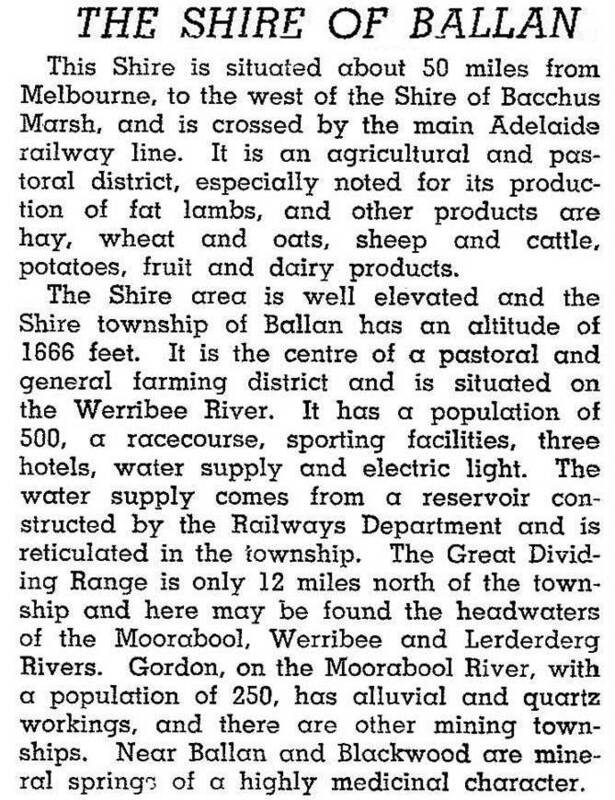 Running westwards through the former shire the Western Freeway and the railway line (1889) pass through or closely bypass Ballan and Gordon. Both have experienced population growth during the 1980s-90s, particularly the former. At the east of the former shire is Greendale, the site of a 130-lot rural/residential subdivision (1969). Towards the south of the former shire the land is elevated. Much of it came under the Yaloak Vale pastoral run (1838). The Yaloak Vale homestead (c1888) is a grand two-storey building. A short way north there is Fiskville, named after Ernest Fisk, the chairman of Amalgamated Wireless A'asia. In 1927 AWA built a large beam wireless station at Fiskville. In 1994, 43% of the shire was farmland, carrying 13,000 meat cattle and 163 sheep and lambs. Ballan shire was united with parts of Bungaree and Buninyong shires to form Moorabool shire on 6 May 1994.